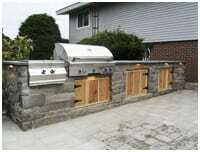 Outdoor fireplaces are designed to serve a number of purposes. Despite their ability to heat an area and provide a comfortable living environment, these products also offer a decorative value to your home. 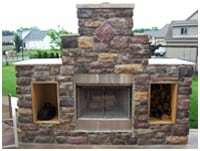 There are a number of fireplace designs to choose from in order to warm up the look of your outdoor living area. Stone, brick and tumbled block are the most popular choices for materials,each offering a very different overall look. The fireplace mantel that you choose will also contribute highly to the appearance of your fireplace. Do you want a wide mantel which fits a number of large objects or a narrow model which only allows space for a few small items? Do you prefer burning real wood or artificial wood? So weather you’re going for a natural, homey look with a wood stove or a modern,classy look with a gas fireplace, sharper edge will walk you through every step of the way from design to completion. Dividing backyard space into outdoor “rooms” is a growing trend in landscape and hardscape design with the biggest focus being on the outdoor kitchens. No longer just a lone charcoal grill,the outdoor kitchen is growing in size and functionality as it steals the spotlight and becomes a main focal point in the backyard. Do you want the counter built at one height or create a split level counter with a portion of the counter at bar height? From which does the prevailing winds come? What are the sun and shade angles in the yard? 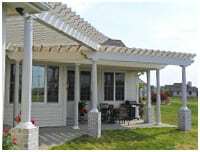 Create a Great Room, add some shade, dine outdoors, or just lounge by the pool under one of our custom made cedar or vinyl pergolas. Our most popular type of pergolas are the garden room pergola style which produces a covered area from the house which may be employed as an outdoor living space. This kind of setting is incredibly suitable for romantic meals with loved ones where you can see the stars and the moon in the evening. The benefits will not only be the amount of time spent in your outdoor living area,but also in the extra value in your home.